Cancer of the Appendix (also known as appendiceal cancer) occurs when cells in the appendix become abnormal and multiply without control. 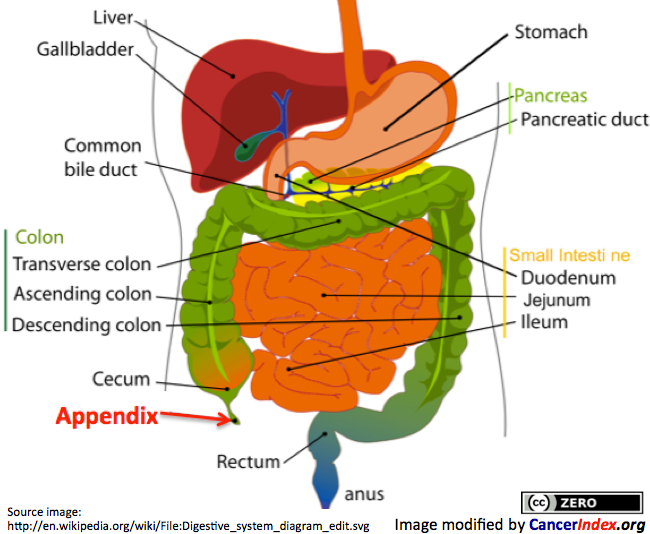 There are a range of different types of tumours and cancers which can start in the appendix. About two thirds of appendix tumours are carcinoid tumours which develop in hormone-producing cells that are present in many parts of the body, including the appendix. Mucinous cystadenocarcinoma account for about a fifth of appendix tumours, these produces mucin (a jelly-like substance). Pseudomyxoma Peritonei (PMP) is a more common name given to the "jelly belly" syndrome caused by mucinous adenoma and mucinous adenocarcinoma. Less common tumours of the appendix include signet-ring cell adenocarcinoma and paraganglioma. Treatment varies according to the type and stage of tumour. A patient-based advocacy organization, founded in 2004, dedicated to serving the needs of those diagnosed with cancer of the appendix. Short overview of appendix cancer and published abstract. Founded by Carolyn Langlie-Lesnik RN BSN, a survivor of appendix cancer. The site includes information about the types of appendix cancer, treatment, survivors' stories, FAQ. Promoting Awareness of PMP (Pseudomyxoma Peritonei), Appendiceal Cancer and other Peritoneal Surface Malignancies. Support network and information about the various forms of appendix cancer. A charitable organization founded in 2008 by a community of individuals affected by Pseudomyxoma Peritonei (PMP) and related Peritoneal Surface Malignancies (PSM). The site includes a FAQ and community information. A registered charity which provides a support network for survivors and carers of Pseudomyxoma Peritonei. For those that are newly diagnosed, there is buddy system, Pseudomyxoma Buddies, which is free of charge and available UK wide. Shooting for a Cure raises money for the Ric Summers Appendical Cancer Research Fund, linked to the MD Anderson Cancer Center in Houston. A site by . Includes histopathology (with images), CT, clinical assessment, pharmacokinetics of intraperitoneal chemotherapy, morphology, cytoreductive surgery, perioperative intraperitoneal chemotherapy, and results of treatment. Mechanical intestinal obstruction secondary to appendiceal mucinous cystadenoma: A case report and brief review. BACKGROUND: Appendiceal mucinous cystadenoma can present in various ways, and it is most commonly encountered incidentally during appendectomy, but mechanical intestinal obstruction secondary to an appendiceal mucocele has been rarely reported. METHODS: We report a case of mechanical intestinal obstruction secondary to appendiceal mucinous cystadenoma. After nasogastric decompression and initial aggressive intravenous fluid resuscitation, an emergency operation was performed under the diagnosis of acute mechanical intestinal obstruction. RESULTS: We performed an appendectomy and intraoperative enteral decompression without anastomoses. The pathologic examination (PE) revealed appendiceal mucinous cystadenoma. After the operation, the patient's recovery went smoothly, and the patient was discharged on the fifth postoperative day. No tumor recurrence was recorded over an 8 month follow-up period. CONCLUSION: Early operative intervention should be recommended to the patient with acute mechanical complete intestinal obstruction, especially the patient who had no previous abdominal surgery. And it is vital to discriminate benign and malignantappendiceal mucocel in determining the extent of surgery. Appendicitis in Cancer Patients Is Often Observed and Can Represent Appendiceal Malignancy. Appendectomy is standard of care for uncomplicated appendicitis, but cancer patients may not be optimal surgical candidates. Interval appendectomy is controversial, and appendiceal malignancy is rare. Study objectives were to review the role of surgery, observation, and interventional radiology (IR)-guided drainage in patients with appendicitis and advanced malignancy. Retrospective review was performed on cancer patients presenting to a tertiary academic cancer center from January 1, 2001 to December 31, 2014. Patients diagnosed with appendicitis were assigned to observation, surgery, and IR drainage after surgical evaluation. Success rates of initial treatment strategies were calculated. Rates of interval appendectomies and pathology were reviewed. Of 72 consults, 32 patients were included. Median age was 53 years, 50 per cent (16/32) were male, 50 per cent (16/32) had chemotherapy less than six weeks to presentation, and 63 per cent (20/32) had advanced stage malignancy. Of the 62.5 per cent (20/32) observed, 25 per cent (8/32) received immediate surgery, 12.5 per cent (4/32) required IR drainage, and 69 per cent (22/32) of patients were initially managed without surgery. Interval appendectomy rate was 19 per cent (6/32). Pathology confirmed appendiceal malignancies in 9.3 per cent (3/32). Cancer patients with acute appendicitis are frequently observed. High incidence of appendiceal malignancy may be due to the older median age. Interval appendectomy should be considered in this population. Incidental Finding of Cerebellar Medulloblastoma on 68Ga-DOTATATE PET/CT in a Patient With Appendiceal Carcinoid. Ga-DOTATATE PET/CT is increasingly used to image somatostatin receptor expressing tumors. Various intracranial tumors including medulloblastoma are known to express somatostatin receptors. We present a case of incidental cerebellar medulloblastoma on a staging Ga-DOTATATE PET/CT for appendiceal carcinoid. Shang J, Ruan LT, Dang Y, et al. BACKGROUND: Adenocarcinoma of appendiceal origin is far rarer than other colorectal carcinomas and its preoperative diagnosis is challenging. To our knowledge, utility of contrast-enhanced ultrasound (CEUS) to diagnose it is much less. METHOD: A 61-year-old man presented with abdominal pain in the right lower quadrant for 20 days. In order to fulfill an accurately preoperative diagnosis, he received laboratory and imaging tests such as carcinoembryonic antigen (CEA), computer tomography (CT), CEUS and endoscope. DIAGNOSIS AND INTERVENTION: He was initially suspected of suffering appendicitis, while his white blood cell count was normal and carcinoembryonic antigen (CEA) in serum was remarkably increased. Both routine ultrasound and computer tomography (CT) examinations supported suppurative appendicitis. The overall data, however, failed to excluded neoplastic pathology thoroughly. Therefore, CEUS was carried out and showed an inhomogeneous enhancement intra the lesion located in the body of the appendix, which made our consideration of neoplasm. The result of the follow-up biopsy guided by endoscope was consistent with appendiceal tumor. The patient received laparoscopic right hemicolectomy. Histopathology confirmed as well differentiated mucinous adenocarcinoma of appendix origin. His postoperative course was uneventful, and he had a regular diet again without any complaint. RESULT: Serum CEA was remarkably increased (12.00 ng/mL). Both routine ultrasound and CT examinations supported suppurative appendicitis. However, CEUS examination showed an inhomogeneous enhancement intra the lesion located in the body of the appendix, which made our consideration of neoplasm. The follow-up biopsy guided by endoscope and surgical specimens confirmed as well differentiated mucinous adenocarcinoma of appendix origin. CONCLUSION: Most mucinous adenocarcinoma mimicking appendicitis results in difficult diagnosis preoperatively. Clinician and radiologist should be aware of it when old patient presented with appendicitis especially along with high level of CEA. Nam MY, Kim MY, Kim YJ, et al. Computed Tomography Features of Appendiceal Metastasis in Patients With Underlying Malignancy: Comparison With Pathological Findings. OBJECTIVE: To evaluate the computed tomography (CT) findings compared with pathologic features and to determine whether CT findings are useful for diagnosis of appendiceal metastasis in patients with underlying malignancy. MATERIALS AND METHODS: Preoperative CT examinations of 59 patients who had underlying malignancy and underwent appendectomy were evaluated. Appendiceal metastasis (n = 21) and nonmetastasis (n = 38) were pathologically confirmed. Computed tomography features (appendiceal morphology and diameter, presence of ascites, rectal shelf, omental cake, lymphadenopathy or organ metastasis) were retrospectively reviewed, and compared with histopathological findings. Fisher exact test and Wilcoxon rank sum test were performed for statistical analysis. RESULTS: Mean diameter of appendiceal metastasis was significantly larger (9.1 mm) than that of nonmetastasis (5.2 mm), (P < 0.0001). The CT morphology of appendiceal metastasis showed broad spectrum, and 3 cases of nodular thickening was only detected in appendiceal metastasis. There was a significant difference between groups (P = 0.0102). Appendiceal metastasis was more frequently associated with peritoneal seeding (ascitis, rectal shelf, omental cake) than nonmetastasis (P < 0.0001). Histopathological invasion of appendiceal metastasis was more frequently seen in serosa-mesoappendix (n = 20, 100%) or muscularis propria (n = 17, 85%), than in submucosa (n = 10, 50%) or mucosa layer (n = 7, 35%). Acute appendicitis was more commonly detected in metastasis (n = 4) than in nonmetastasis (n = 1) (P = 0.0495). CONCLUSIONS: Evaluation of CT features of appendix and peritoneum may be useful for prediction of appendiceal metastasis in patients with underlying malignancy. Lynch K, Cho S, Andres R, et al. Pre-operative Identification and Surgical Management of the Appendiceal Mucocele: A Case Report. An appendiceal mucocele (AM) is an uncommon differential in the patient being evaluated for acute appendicitis. Although often asymptomatic, AMs can clinically mimic acute appendicitis, and preoperative distinction between these processes facilitates optimal management. We report the case of a 60-year-old male with an AM presenting with nausea and periumbilical pain radiating to the right lower quadrant. Literature relevant to the diagnosis and treatment of AMs is reviewed, with emphasis on diagnosis through radiographic imaging and surgical management. Abdominal CT scan or ultrasound are useful in identifying AMs preoperatively. A decision to perform a right hemicolectomy should be influenced by the criteria reported by Gonzalez-Moreno. The safety of the laparoscopic resection relative to an open appendectomy is debated. Meeks MW, Grace S, Chen Y, et al. Synchronous Quadruple Primary Neoplasms: Colon Adenocarcinoma, Collision Tumor of Neuroendocrine Tumor and Schwann Cell Hamartoma and Sessile Serrated Adenoma of the Appendix. Quadruple synchronous primary neoplasms are very rare with only three cases reported in the English-speaking literature to date. Collision tumors are also rare entities, especially of the appendix. We herein report a case of synchronous quadruple primary neoplasm in a 95-year-old female. She was diagnosed with colon adenocarcinoma, sessile serrated adenoma of the appendix and a collision tumor composed of a well-differentiated neuroendocrine tumor and Schwann cell hamartoma. Histological examination and immunohistochemistry supported these four lesions as separate entities. This case is unique because we report the diagnosis of quadruple synchronous primary, an extremely rare occurrence, in addition to a collision tumor of the appendix. We also provide a review of the literature for synchronous neoplasms and collision tumors. Agrusa A, Romano G, Galia M, et al. Appendiceal mucinous neoplasms: an uncertain nosological entity. Report of a case. INTRODUCTION: Appendiceal mucocele is a relatively rare condition characterized by progressive dilation of the appendix caused by intraluminal accumulation of mucoid substance. Its incidence is 0.07 - 0,63% of all appendectomies performed. CASE REPORT: We report the case of a 70-year-old man who came to our observation with gravative pain in right lower abdominal region. A computed tomography abdominal scan revealed a cystic/tubular structure like an appendicular mass with wall enhancement but without calcifications suggestive of a mucocele. Into peritoneal cavity we found profuse mucinous material with a 1,5 cm size parietal nodule. We also identified a free perforation of the cecum with consensual spillage of gelatinous material mimicking a pseudomyxoma peritonei. We decided to perform a right hemicolectomy with excision of peritoneal lesion. DISCUSSION: The controversy in the pathologic terminology can give rise to a clinical dilemma in terms of the management and follow-up plans. For mucosal hyperplasia and cystadenoma simple appendectomy is curative. Only in case of large base of implantation it may be necessary the resection of the ileum and caecum or right hemicolectomy. In case of mucinous cystoadenocarcinoma authors perform a right hemicolectomy. CONCLUSION: Appendiceal mucinous neoplasms are different pathological entities. The correct surgical management depends on size and location of lesion. A preoperative diagnosis is obviously needed in order to perform the correct treatment. CT abdominal scan is the better diagnostic tool, but different authors show their inability to reach a preoperative diagnosis in the larger majority of cases. Gui X, Meng Z, McConnell YJ, et al. Differing expression profiles of Notch/enterocyte and Wnt/secretory lineage signallings are associated with morphological diversity of appendiceal tumours. BACKGROUND: Tumours of appendix, including classic carcinoid tumour (CCT), goblet cell carcinoid (GCC), low-grade appendiceal mucinous neoplasm, high-grade appendiceal mucinous neoplasm/mucinous carcinoma (MCA) and non-mucinous adenocarcinoma (NMA), show different and sometimes mixed morphological features. It was hypothesised that these tumours originate from common tumour stem cell(s) with potential of various cell lineage differentiation. In normal intestinal epithelium, absorptive lineage (enterocytes) differentiation is driven by Notch-Hes1 pathway, while secretory lineage is driven by Wnt-Math1 pathway and further separated by different downstream signallings into three sublineages (Gfi1-Klf4/Elf3 for goblet cells, Gfi1-Sox9 for Paneth cells and Ngn3-Pdx1/Beta2/Pax4 for enteroendocrine cells). METHODS: The expressions of various signalling proteins in different appendiceal tumours were detected by immunohistochemistry on tumour tissue microarray. RESULTS: CCT showed reduced Hes1/Elf3 and Sox9/Klf4 coupled with elevated Math1, in keeping with endocrine phenotype. As compared with CCT, GCC showed higher Klf4 and similar Ngn3/Pax4, indicative of a shift of differentiation towards goblet cells as well as endocrine cells. GCC displayed a Notch signalling similar to adenocarcinoma. Mucinous tumours showed lower Elf3 than normal appendiceal epithelium and higher Math1/Gfi1/Klf4, suggestive of a differentiation towards less enterocytes but more goblet cells. NMA showed Notch signalling similar to other glandular tumours, but lower Klf4. However, some seemingly paradoxical changes were also observed, probably suggesting gene mutations and/or our incomplete understanding of the intestinal cell differentiation. CONCLUSIONS: Wnt/secretory lineage protein and Notch/absorptive lineage protein expression profiles are generally associated with the tumour cell differentiation and morphological diversity of common appendiceal tumours. Watanabe HA, Fujimoto T, Kato Y, et al. Acute appendicitis with a neuroendocrine tumor G1 (carcinoid): pitfalls of conservative treatment. A man in his early thirties presented to our clinic with right lower abdominal pain. Computed tomography (CT) and ultrasonography (US) revealed a swollen appendix and an appendicolith. Abscess formation was not observed but ongoing appendiceal rupture was not ruled out. Three months after successful conservative therapy, the lumen of the apical portion was kept dilated and laparoscopic interval appendectomy was performed. No tumorous findings were observed macroscopically. However, histology revealed many tiny nests infiltrating the submucosa, muscular layer, and subserosa at the root of the appendix. An appendiceal neuroendocrine tumor G1 (NET G1; carcinoid) was diagnosed immunohistologically. Neither CT nor US visualized the tumor because of its non-tumor-forming but infiltrative growth. In conclusion, after successful conservative treatment, interval appendectomy should be considered to uncover a possible appendiceal NET G1 (carcinoid), particularly when dilatation of the distal lumen is kept under observation. Cosyns S, Polyzos NP, Carprieaux M, et al. The role of appendectomy as part of the treatment of a mucinous borderline ovarian tumor. UNLABELLED: Guidelines in surgical treatment of mucinous ovarian neoplasms recommend the use of appendectomy as a measure to rule out a primary appendiceal origin of the ovarian tumor and proper staging. In extension this guideline is also applied for mucinous borderline ovarian tumors (mBOTs). As borderline ovarian tumors (BOTs) are often diagnosed postoperatively, most patients must undergo a second surgery to add appendectomy and staging to their surgical treatment. OBJECTIVE: To assess the role of appendectomy as part of the surgical treatment of mucinous BOTs. MATERIALS AND METHODS: A retrospective single institute based study was carried out. The authors evaluated the clinical charts of patients undergoing surgical treatment by a gynecologic oncologist in their institution for a mucinous BOT between January 1990 and January 2014. RESULTS: Twenty-seven patients were included. Appendectomy was performed in 30% of patients during primary or secondary surgical treatment. No appendiceal carcinoma was identified in any of the cases. Five patients already had a previous appendectomy. In eight patients the appendix was described as normal during surgery and left in place. For six patients the authors did not retrieve any information on previous appendectomy neither on the intraoperative state of the appendix. In the present overall study population, 78% showed no appendiceal involvement. For the remaining patients this information was missing. CONCLUSIONS: Secondary appendectomy to rule out a primary appendiceal origin of the mucinous BOT should not be performed when the appendix is described as grossly normal during primary laparoscopic surgery. Ansari N, Chandrakumaran K, Dayal S, et al. Cytoreductive surgery and hyperthermic intraperitoneal chemotherapy in 1000 patients with perforated appendiceal epithelial tumours. PURPOSE: To report early and long term outcomes following cytoreductive surgery (CRS) and hyperthermic intraperitoneal chemotherapy (HIPEC) in 1000 patients with perforated appendiceal epithelial tumours, predominantly with pseudomyxoma peritonei (PMP). METHODS: Retrospective analysis of a prospective database of 1000 consecutive patients undergoing CRS and HIPEC for perforated appendiceal tumours between 1994 and 2014 in a UK National Peritoneal Malignancy unit. RESULTS: Overall 1000/1444 (69.2%) patients treated for peritoneal malignancy had appendiceal primary tumours. Of these 738/1000 (73.8%) underwent complete cytoreductive surgery (CCRS), 242 (24.2%) had maximal tumour debulking (MTD) and 20 (2%) had laparotomy and biopsies only. Treatment related 30-day mortality was 0.8% in CCRS and 1.7% in MTD group with major postoperative morbidity rates of 15.2% (CCRS) and 14.5% (MTD). Five- and 10-year overall survival was 87.4% and 70.3% in the 738 patients who had CCRS compared with 39.2% and 8.1% respectively in the MTD group. On multivariate analysis, significant predictors of reduced overall survival were male gender (p = 0.022), elevated CEA (p = 0.001), elevated CA125 (p = 0.001) and high tumour grade or adenocarcinoma (p = 0.001). CONCLUSIONS: Perforated epithelial appendiceal tumours are rare, though may be increasing in incidence and can present unexpectedly at elective or emergency abdominal surgery, often with PMP. CRS and HIPEC results in good long term outcomes in most patients. Heterotopic ossification in appendiceal mucinous neoplasms: clinicopathological characteristics of 3 cases. Heterotopic bone formation is a very rare event in the gastrointestinal tract including in the appendix. Here we report three cases of heterotopic ossification in appendiceal mucinous neoplasms, one occurring in an appendiceal mucinous cystadenoma, another in a low-grade appendiceal mucinous neoplasm, and the third occurring in an appendiceal mucinous adenocarcinoma. The clinicopathologic characteristics of these three present cases and two previously reported cases are discussed in detail. The mechanism of heterotopic ossification in appendiceal mucinous neoplasm is still unclear, but mucin extravasation and subsequent calcification may be predisposing events. Ganesh V, Probyn L, Vuong S, et al. A case report of bone metastases from appendiceal adenocarcinoma and a review of literature. Appendiceal adenocarcinoma (AA) is a rare cancer, accounting for less than 0.5% of all gastrointestinal cancers. As such, there is still debate surrounding both the nature of the disease and the roles of different treatment modalities in the care of this patient population. Metastases of AA, particularly distant metastases, have not been explored extensively in literature. As survival in optimally treated cases of AA continues to improve, clinicians may encounter previously unrealized complications of this disease or unlikely metastases at a higher frequency. We reported the rare case of a 50-year-old male with recurrent mucinous AA who developed painful pelvic bone metastases. To palliate his symptoms, the patient underwent 30 Gy of external beam radiation treatment (EBRT) in 10 fractions to the pelvis. The patient achieved a good pain response after completion of EBRT, with elimination of analgesic use one month post-treatment. This case demonstrates successful palliative management of bone metastases from a primary mucinous AA. Although there is a lack of evidence-based guidelines specific to the treatment of AA, there are a variety of therapies available [e.g., chemotherapy, cytoreductive surgery (CRS), radiation, etc.]. The use of these treatments is largely determined by prognostic factors. Badyal RK, Khairwa A, Rajwanshi A, et al. Significance of epithelial cell clusters in pseudomyxoma peritonei. BACKGROUND: Pseudomyxoma peritonei (PMP) is a rare clinical syndrome characterised by distension of the peritoneum by jelly-like ascites. Cytological evaluation of peritoneal fluid is often an initial diagnostic test for possible ovarian and/or appendiceal primary tumours. AIMS AND OBJECTIVES: The present work was conducted to study the usefulness of peritoneal fluid cytomorphology in the early diagnosis of PMP and to evaluate the significance of the presence of epithelial cell (EC) clusters and their prognostic implications. MATERIALS AND METHODS: We evaluated the detailed cytological features of 21 cases of PMP retrospectively. Both conventional and liquid-based cytology smears of peritoneal fluid were reviewed, cytological features were compared with histological findings and cases were classified into disseminated peritoneal adenomucinosis (DPAM) and peritoneal mucinous carcinomatosis (PMCA). RESULTS: In our study, the common causes of PMP were primary gastrointestinal malignancies (appendix and colorectal, 57.14%), followed by primary ovarian mucinous neoplasms (28.57%) and synchronous ovarian and appendicular tumours (14.28%). Thick mucinous material was present in all cases (100%). ECs were present in 18 of 21 (85.17%) patients, with mild nuclear atypia in the majority of cases. Histiocytes, mesothelial cells and fibroblast-like, spindle-shaped cells with entrapped mucin were also noted in the background. The cases of PMCA showed greater numbers of EC clusters in cytology smears and these patients had recurrent episodes of PMP. CONCLUSION: On cytomorphology, high-grade tumours were more cellular and frequently showed EC clusters with moderate to severe atypia, prominent nucleoli and mitosis, and were more prone to PMCA. Son IT, Ahn S, Park KJ, et al. Comparison of long-term oncological outcomes of appendiceal cancer and colon cancer: A multicenter retrospective study. BACKGROUND: There has been no comparative study of the long-term oncological outcomes of appendiceal cancer and colon cancer. We hypothesized that the oncological outcome is worse in appendiceal cancer because perforation is more frequent than in colon cancer. METHODS: Patients with stage I-III were selected from 5046 patients with appendiceal or colon cancer, between September 2001 and June 2010. The 5-year disease-free survival (DFS) was the primary endpoint. Multivariate analyses with Cox proportional hazards model for DFS and logistic regression model for perforation were conducted. A matching model was used to compensate for the heterogeneity between groups. RESULTS: The perforation rate was 44.7% in appendiceal cancer (n = 47), but 1.1% in colon cancer (n = 2828) (p = 0.001). The 5-year DFS rate was lower in appendiceal cancer than in colon cancer (57.9% vs. 85.2%, p = 0.001; matching model, 54.2% vs. 78.4%, p = 0.038), with a higher rate of peritoneal seeding (25.5% vs. 2.5%, p = 0.001; matching model, 24.0% vs. 4.0%, p = 0.007). Multivariate Cox regression showed that appendiceal cancer was an independent prognostic factor for poor DFS (hazard ratio = 2.602, 95% confidence interval = 1.26-5.35, p = 0.009), and logistic regression confirmed that appendiceal cancer was the risk factor associated with perforation (odds ratio = 66.265, 95% confidence interval = 28.21-155.61, p = 0.001). CONCLUSIONS: This study suggested that the long-term oncological outcomes are worse for appendiceal cancer than for colon cancer, attributed to higher perforation rate in appendiceal cancer. Nagata H, Kondo Y, Kawai K, et al. A giant mucinous cystadenocarcinoma of the appendix: a case report and review of the literature. BACKGROUND: Mucinous cystadenocarcinoma is the second most common etiology of appendiceal mucocele. We report a relatively rare case of a giant appendiceal mucocele caused by mucinous cystadenocarcinoma, which occupied the entire abdomen of an adult woman. CASE PRESENTATION: A 63-year-old woman presented with a chief complaint of abdominal distention. Imaging studies showed a giant cystic mass occupying her entire abdomen. Laparotomy confirmed a giant appendiceal mucocele, and the patient underwent ileocecal resection. A mucinous deposit was not found in her abdominal cavity, and the ovaries were grossly normal bilaterally. The pathological diagnosis was mucinous adenocarcinoma with a low-grade mucinous neoplasm that invaded the subserosa. Regional lymph node metastasis was not found. She has had recurrence-free survival for 5 years. CONCLUSIONS: The present case is the largest appendiceal cystadenocarcinoma ever reported. The optimal treatment of an appendiceal neoplasm requires further research based on consensus terminology of an appendiceal mucocele. Chronic inflammation masquerading as an appendiceal tumour with peritoneal metastasis: the challenge of diagnosis and the lessons learnt. Advanced radiological imaging has largely replaced exploratory operations and has become an essential diagnostic tool clinicians routinely rely on. However, physicians are faced with a lot of radiological findings without histological proof, and assuming a more serious diagnosis may lead to unnecessary investigations and emotional stress for patients. We report an unusual presentation of chronic appendicitis with a synchronous peritoneal nodule on CT in a 76-year-old woman who presented with poor appetite, weight loss and a mass in the right iliac fossa. The coincidental finding of the nodule in addition to the suspicious appearance of the appendix raised concerns for primary appendiceal cancer with peritoneal metastasis. The case illustrates the patient's management and reflects on the learnt lessons with regard to careful use of invasive radiology-guided biopsies and interval imaging, as these could sometimes delay the diagnosis and management of a readily treatable disease. Primary choriocarcinoma of appendix mimicking acute appendicitis. Choriocarcinoma is a malignant trophoblastic cancer, the incidence of primary choriocarcinoma (PCC) of the gastrointestinal tract (GIT) being extremely rare, with only 14 cases being reported in worldwide literature. Here we present an extremely rare case of PCCof the appendix in a 32-year-old male who presented with acute pain abdomen. Histopathological examination revealed PCC of the appendix. Examination of the testis was unremarkable. Further investigations revealed a very high serum beta-human chorionic gonadotropin (b-HCG) titer with a normal carcinoembryonic antigen (CEA). Radiological imaging showed multiple areas of liver metastasis. Chemotherapy-based treatment with bleomycin, etoposide, and cisplatin (BEP) regime was advised, however the patient failed to follow-up for further management. Hakima L, Mohanty SK, Pradhan D, et al. Myxoid degeneration of appendix wall: An entity in search of identity: Report of two cases. Myxoid degeneration of the appendix wall without accompanying acute appendicitis (AA) is rare. We report two cases of myxoid degeneration of appendix associated with appendiceal adhesions. Both the cases showed marked splitting and disruption of smooth muscle fibers of muscularis propria by abundant myxoid ground substance and dispersed degenerated hypereosinophilic myofibers with pyknotic nuclei. Scattered degenerated myocytes with vacuolated cytoplasm were also identified. Focal serosal fibrosis was observed in both cases. We reviewed other pathologic processes that involve the appendix such as fibrous obliteration, AA, and appendiceal mucinous neoplasm (AMN) and conclude that the constellations of pathologic findings described herein are unique. Nonneoplastic dissecting myxoid degeneration of the appendix muscularis propria has not been reported in the pathology literature to date. The pathologic nature of appendiceal mucinous stromal change remains unclear; however, we hypothesize that the lesion occurs as a consequence of traction related injury to the appendix. Menassel B, Duclos A, Passot G, et al. Preoperative CT and MRI prediction of non-resectability in patients treated for pseudomyxoma peritonei from mucinous appendiceal neoplasms. AIMS: To evaluate computed tomography (CT) and magnetic resonance imaging (MRI) findings for sign of hepatoduodenal ligament and small bowel non-resectability in patients with pseudomyxoma peritonei (PMP) and to compare assessments made by the radiologist based on their experiences. METHODS: Between January 2009 and June 2014, all consecutive patients with PMP selected for curative surgery were scheduled to undergo CT and MRI examinations within two days of their surgery. Several imaging findings of hepatoduodenal ligament and small bowel involvements were retrospectively evaluated by a senior and a junior radiologist and compared with surgical findings. RESULTS: Of the 82 patients enrolled in the study, 11 had non-resectable lesions with hepatoduodenal ligament infiltration (n = 4) and/or extensive small bowel involvement (n = 9). All patients underwent CT and 73 underwent MRI scan. Infiltration of the adipose tissue of the hepatoduodenal ligament by mucinous tumor was associated with non-resectability. For the senior and junior radiologists, the sensitivity and specificity were 75% and 100%, and 50% and 100% on CT (kappa value (k) = 0.79); 67% and 100%, and 33% and 97% on MRI (k = 0.38), respectively. Diffuse involvement of the mesentery and/or the small bowel serosa was also associated with non-resectability. For the senior and junior radiologists, the sensitivity and specificity were 67% and 100%, and 56% and 99% on CT (k = 0.82); 88% and 100%, and 38% and 100% on MRI (k = 0.58), respectively. CONCLUSION: CT and MRI can both contribute to the diagnosis of non-resectability in patients with PMP. The use of MRI to identify small bowel involvement, in particular, benefits from a more experienced radiologist. Incidental neuroendocrine tumor of the appendiceal base less than20 mm in diameter: is appendectomy enough? The appendixis the second primary site for neuroendocrine tumors. The management of incidentelly discovered neuroendocrine tumor of the appendiceal base less than 20 mm in diameter is still controversal. The aim of this study was to discuss the management of such tumors. Three patients were operated on for acute appendicitis. Histopathologic examination of surgery specimens revealed neuroendocrine tumors of the appendiceal base less than 20 mm in diameter. Since no one presented with poor prognostic factors, no complementary right hemicolectomy was performed. No recurrence was observed. The existence of poorprognostic factors at histopathologic examination should indicate complementary right hemicolectomy for incidental neuroendocrine tumor of the appendiceal base less than 20 mm in diameter. Two rare cases of appendiceal collision tumours involving an appendiceal mucinous neoplasm and carcinoid. We report two rare cases of appendiceal collision tumours, each involving an appendiceal mucinous neoplasm with a concomitant appendiceal carcinoid. The first case presented with acute appendicitis while the second presented with an incidental radiological finding of an enlarged appendix as part of evaluation for raised serum carcinoembryonic antigen. Diagnosis in both cases was made postoperatively on histological assessment following appendicectomy. Clinical and histological features of both tumour types in each case did not necessitate further surgical resection or adjuvant treatment. Both patients did well postoperatively and had no evidence of disease recurrence on follow-up. Ileocecal Intussusception Caused by an Appendiceal Neoplasm. Mucinous appendiceal neoplasm occurs in less than 1% of appendicectomies. Majority of what is known in the literature is about pseudomyxoma peritonei, which exists as its disseminated form. Pictorial imagery of its pre-disseminated form is rarely observed. We present in a case report form a case of low-grade mucinous neoplasm of the appendix resulting in focal intussusception including images captured from this unique case that will become a learning case for readers of the journal. Levine EA, Votanopoulos KI, Qasem SA, et al. Prognostic Molecular Subtypes of Low-Grade Cancer of the Appendix. BACKGROUND: Appendiceal cancer (AC) patients treated with cytoreductive surgery (CRS) and hyperthermic intraperitoneal chemotherapy (HIPEC) often demonstrate an unpredictable variability in their survival outcomes. Biomarkers predictive of CRS/HIPEC efficacy could better guide treatment decisions. We hypothesized that variation in the transcriptional programming of AC tumors might distinguish molecular subtypes with differential outcomes after CRS/HIPEC. STUDY DESIGN: Gene expression profiles of 2 AC cohorts were analyzed using Affymetrix whole-genome expression microarrays. Hierarchical clustering methods, Kaplan-Meier analysis, and Cox regression models were used to discover and validate prognostic molecular subtypes of AC. Gene set enrichment analysis was used to infer pathologic attributes of the molecular subtypes. RESULTS: Unsupervised hierarchical clustering analysis of tumor expression profiles revealed a 139-gene cassette that distinguished 2 molecular subtypes (based on low vs high expression of the gene cassette) with statistically significant survival differences (disease-specific survival, p = 0.0075; progression-free survival, p = 0.0072). In a second AC cohort, the 139-gene cassette reproducibly partitioned tumors into subtypes with significant survival differences. Tumors showing high relative expression of the genes comprising the cassette associated with poor survival outcomes (disease-specific survival, p = 0.047; progression-free survival, p = 0.0079), and exhibited gene expression patterns enriched for oncogenic processes and pathways. The prognostic value of the molecular subtypes was specific for low-grade appendiceal tumors (disease-specific survival, p = 0.028; progression-free survival, p = 0.0016), and remained significant in the presence of conventional prognostic markers, including grade, surgical resection score, Eastern Cooperative Oncology Group status, and age. CONCLUSIONS: The 139-gene cassette can have actionable clinical utility for identifying low-grade appendiceal tumor molecular subtypes predictive of therapeutic efficacy of CRS/HIPEC. González-Sánchez-Migallón E, Valero-Navarro G, Sola-Pérez J, et al. Adenocarcinoid tumour of the appendix is a rare entity characterised by the presence of a double component (neuroendocrine and glandular). It originates in the neuroendocrine cells of the appendicular mucosa. A preoperative diagnosis of a primary appendiceal tumour is uncommon and more so one suggesting an adenocarcinoid pathology. Optimal treatment is debated between a simple appendectomy and a more extensive resection, which occasionally includes hysterectomy and bilateral ovariectomy. Our aim is to report this rare entity and conduct a review of the literature on the different treatment options. Appendiceal Immunoglobulin G4-Related Disease Mimicking Appendiceal Tumor or Appendicitis: A Case Report. Immunoglobulin G4 (IgG4)-related disease is an autoimmune disease that forms tumorous lesions. Several cases involving various organs are reported, however, IgG4-related disease involving appendix has not been reported yet. In this report, we presented a case of IgG4-related disease of appendix, which raised a suspicion of appendiceal tumor or usual appendicitis and, therefore, led to unnecessary surgical resection. IgG4-related disease should be considered in the differential diagnosis for a mass-like swelling of the appendix, in order to avoid unnecessary surgery. Life after hyperthermic intraperitoneal chemotherapy; measuring quality of life and performance status after cytoreductive surgery plus hyperthermic intraperitoneal chemotherapy. BACKGROUND: Patients who undergo cytoreductive surgery (CRS) with hyperthermic intraperitoneal chemotherapy (HIPEC) can return to an acceptable performance status (PS) and quality of life 3 months postoperative. METHODS: An HIPEC specific questionnaire was developed based on the validated Functional Assessment of Cancer Therapy Questionnaire. Each patient was contacted and questionnaire completed. An averaged score was calculated and stratified to an Eastern Cooperative Oncology Group PS. A retrospective chart review gathered patient characteristics and correlated to the patient's 3 months postoperative PS. RESULTS: Between October 2011 and July 2014, 43 patients underwent complete CRS with HIPEC. The most common indications for surgery were colorectal (35%) and appendiceal malignancy (47%). Average scores were: physical well-being 15.4 of 20, social well-being 17.5 of 20, recovery 15 of 20, mental well-being 13.4 of 20, and functional well-being 18.1 of 24. These correlated to an Eastern Cooperative Oncology Group PS of 1, 0, 1, 1, and 1. Patient's age (P = .235), operative length (P = .181), hospital duration (P = .43), complications or peritoneal carcinomatosis index (P = .815) demonstrated no significance relative to postoperative PS. CONCLUSIONS: Patients can recovery well from CRS with HIPEC. It is possible to return to an acceptable functional status within 3 months postoperative. Age, operative time, length of hospital stay, or peritoneal carcinomatosis index have no prohibitive effects on a long-term recovery. Lyon TD, Turner Ii RM, Nikonow TN, et al. Effect of a concomitant urologic procedure on outcomes following cytoreductive surgery with hyperthermic intraperitoneal chemotherapy. BACKGROUND AND OBJECTIVES: To evaluate whether urologic procedures during cytoreductive surgery with hyperthermic intraperitoneal chemotherapy (CRS-HIPEC) are associated with adverse postoperative outcomes. METHODS: We identified patients who underwent CRS-HIPEC at our institution from 2001 to 2012 and compared outcomes between operations that did and did not include a urologic procedure. RESULTS: A total of 938 CRS-HIPEC procedures were performed, 71 of which included a urologic intervention. Urologic interventions were associated with longer operative times (547 vs. 459 min, P < 0.001) and greater length of stay (15 vs. 12 days, P = 0.003). Major complications (Clavien III and IV) were more common in the urologic group (31% vs. 20%, P = 0.028). On multivariable analysis, urologic procedures were associated with a low anterior resection (OR: 2.25, 95%CI 1.07-4.74, P = 0.033) and a greater number of enteric anastomoses (OR: 1.83, 95%CI 1.31-2.56, P < 0.001). At a median follow up of 17 months (IQR 5.6-35 months), addition of a urologic procedure did not significantly impact overall survival for appendiceal or colorectal cancers. CONCLUSION: Urologic surgery at the time of CRS-HIPEC is associated with longer operative times, length of stay and increased risk of major complications, but not with decreased overall survival. J. Surg. Oncol. 2016;113:218-222. © 2016 Wiley Periodicals, Inc.
Wagner PL, Austin F, Zenati M, et al. Oncologic Risk Stratification Following Cytoreductive Surgery and Hyperthermic Intraperitoneal Chemotherapy for Appendiceal Carcinomatosis. INTRODUCTION: Patients with peritoneal carcinomatosis (PC) of appendiceal origin demonstrate variable oncologic outcomes, despite aggressive cytoreductive surgery and hyperthermic intraperitoneal chemotherapy (CRS-HIPEC). We sought to devise a prognostic risk stratification system for oncologic outcomes following CRS-HIPEC. METHODS: A total of 197 patients undergoing CRS-HIPEC for the treatment of appendiceal PC were reviewed from a prospective database. Kaplan-Meier survival curves and multivariate Cox regression models were used to identify prognostic factors affecting oncologic outcomes. Clinicopathologic variables affecting overall survival (OS) were utilized to develop a prognostic staging system and nomograms. RESULTS: Univariate and multivariate Cox regression analysis indicated that high-grade tumor histology, lymph node metastasis, and incomplete cytoreduction were high-risk features, adversely affecting OS. Patients were stratified on the presence of high-risk features as follows: low-risk patients had no risk factors (n = 102); intermediate-risk patients had one risk factor (n = 49); and high-risk patients had more than one risk factor (n = 46). Median OS for low-risk patients was not reached, and was 43 and 22 months for intermediate-risk and high-risk patients, respectively. Five-year OS was 72, 43, and 13 % for low-, intermediate- and high-risk patients, respectively (p < 0.0003 for low vs. intermediate risk, and p = 0.06 for intermediate vs. high risk). CONCLUSIONS: We propose a three-tier staging system for appendiceal PC following CRS-HIPEC, based on histologic grade, lymph node involvement, and completeness of cytoreduction. The presence of any one or more of these high-risk features significantly decreased survival in our single-institution database and provided the basis for a prognostic staging system and corresponding nomograms.